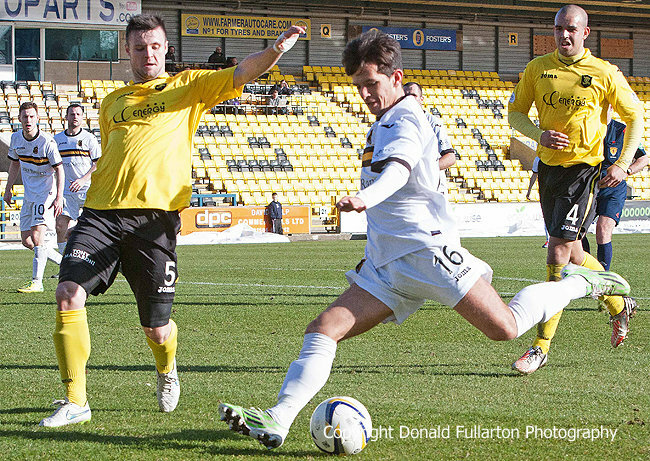 DUMBARTON virtually made sure of playing in the Championship next season with a vital 2-1 win over bottom-placed Livingston at Almondvale. A crowd of 850 saw Sons stretch their lead over the home side to 17 points and over Alloa Athletic and Cowdenbeath to 11 points. For most of the game that did not seem the likely outcome as the Livi Lions fought for their lives with good football mixed with crunching tackles. They took an early lead when Craig Sives headed home a goal which was a carbon copy of Danny Wilson's for Hearts against Dumbarton the previous weeks. They kept up the pressure to half-time although the visitors did mount some good attacks, and it was much same for most of the second half. However the visitors were keeping the best till last. With ten minutes remaining Scott Agnew broke forward and was fouled just outside the box. He took the free kick himself and netted with a spectacular power drive. In the final minutes Garry Fleming thrashed home an even more spectacular volley from distance to give the Sons three points, and the celebrations began on the field and amongst the travelling support. The picture shows Dylan Easton lining up a first half shot.